This fixture is designed for recessed ceiling mounting application. Perfect for commercial office spaces, schools, hospitals or hospitals or retail merchandising areas. Optimized for T8 or T5 lamp performance. Computer-aided housing design allows for optimum luminaire efficiency. Cam action latches and die formed T-hinges for door insertion from either side. 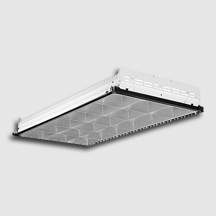 Nominal 3” deep louver for excellent cut off and glare control. Housing constructed of structurally embossed, heavy gauge, cold rolled steel. Die-formed flat steel door with mitered corners for clean appearance. Wire way covers snap in for easy attachment and removal. Access plate provides top access to wire way.